It’s the 25th and the Intentional Printing blog hop is pretty much wound up. There were 60 comments on my post so I had my daughter pick a number between 1 and 60. She chose seven. Pam R was the seventh commenter and she’ll be getting her very own copy of the book. Yay! Thanks to everyone for participating and I hope that many of you go out and buy the book anyway. It’s a great resource and kick in the pants for anyone ready to dip their toes into surface design. Wednesday I’ll be delivering artwork to the VisArts gallery in MD for the SAQA regional show, Tarnish. If you happen to be in town for the SAQA conference (or just happen to be in the area), please come to the opening reception Friday, May 9th, from 7 to 9pm. I’ll be there! And, in case it wasn’t obvious, the organizers chose my piece, Dominant, to be the image on their flyer. Yay! I went back to DC on Saturday, this time was to visit the Smithsonian Craft Show so I left the kids at home. Being the height of Cherry Blossom Festival, I decided to use a Park and Ride and take the metro into town. There was a HUGE line waiting to buy Metro tickets, but luckily I already had one and zipped right in. Perks of being (kinda) local. I kept seeing cute little kids everywhere, and the gregarious toddler on the Metro who wanted to fist bump was adorable. But, the winner of them all was the little guy and his red trombone rocking it out with the rest of the guys in this raucous brass band. There was plenty of other lovely jewelry, to include pieces made from zippers by Kate Cusack. I was close to buying a Bubbles necklace. After my weaving and knitting work with plastic bags, I was inspired by coil baskets by Jackie Abrams, and pod shaped basketry by JoAnne Russo. I liked the whimsical jewelry made from musical instrument parts by Lisa Cylinder, but ultimately went home with irreverent mugs from Beer’s Pottery. I had a nice chat with Chris Roberts Antieau whose work I admired at the Visionary Arts Museum in Baltimore. Her more recent work is a lot more realistic and detailed than her usual comic-like panels, but it is wonderfully magical and still very narrative. I liked her masks of stitched memories on taxidermy. The javelina reminded me of our time living in Arizona. I also had a nice chat with Lisa Call. Having been to her booth in Baltimore the first year she was there, it was interesting to talk about the similarities and differences. It looks like the Smithsonian is a good match for her. No photo here since the light in my photo of her in her booth was fighting us. She’s got much better photos on her blog. In the Art Quilt world there is always this Art versus Craft debate, and I have to say, if this is the kind of craft I could be associated with , I don’t mind at all. In fact, I aspire to the level of craft I see at these type of shows. I also aspire to have my work called Art, but really, I’d be happy with either moniker. Since the Smithsonian show wasn’t huge, I wandered over to the National Portrait Gallery to see a little more than Brenda and I had on our overview several months ago. I still think the presidential portraits are the best part of the collection. The collection just wouldn’t be as at home any place outside a national gallery in a capitol city. I noticed that while there were a lot of paintings of American Indians, I didn’t notice any BY American Indians. Also, most everything pre-Modern was very white, although the more contemporary galleries had a lot of African Americans represented. With all the American landscapes, I was hoping that there would be at least one painting of Kilauea, or something Hawaiian, but nothing I could find. I guess I was hoping, in a National gallery, to see the diversity of our nation a little more thoroughly represented. There was certainly beautiful and thought provoking art to be seen and enjoyed though. I was drawn to a portrait of Leonard Wood, a founder of the Rough riders with Teddy Roosevelt and an iron fisted leader in Cuba whom I care little about, but was drawn in to find that it was painted by my most favorite portraitist, John Singer Sargent. Walking down a hall I was grabbed by a large, contorted, Spanish dancer, and sure enough, she was painted by Sargent. Then, there was a portrait of a man with a cat in his lap that looked Sargent-esque. Giggling to myself, I though, “well he doesn’t look like an evil genius.” Much to my pleasure, I discovered that the painting was by Cecilia Beaux, and the label read “at a time when few woman could, she carved out a career for herself as a portraitist, and was thought to rival John Singer Sargent. It was the best of all worlds — Sargent-like in style and skill, by a woman, and including a cat! Be still my beating heart. Finally, I took myself out to dinner before heading home. Way back when, I used to post a lot (or it seemed a lot to me) about the German fests and sights we used to visit. There was a lot of cultural fun to post about in Hawai’i too. But lately, I’ve been feeling like I haven’t posted much about life outside my sewing basket. Part of it is that we haven’t been nearly as adventurous here in Virginia. We may also have binged on too much Monticello in our first year, if that’s at all possible. 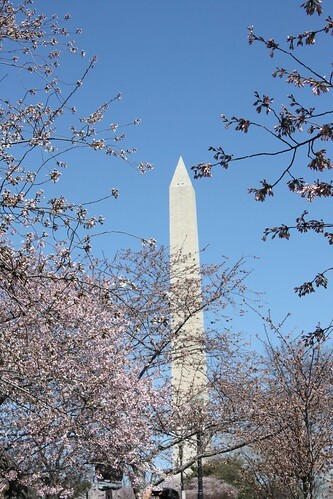 However, Sunday took us to DC, to see if the cherry blossoms had bloomed. Not quite, but it was a fabulous spring day and we thoroughly enjoyed being outside. 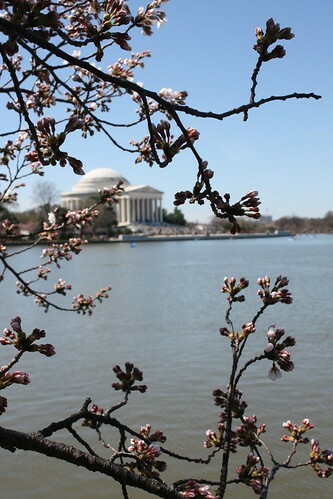 The cherry trees are concentrated near the Tidal Basin, which is also the site of the Thomas Jefferson Memorial. He’s our guy. 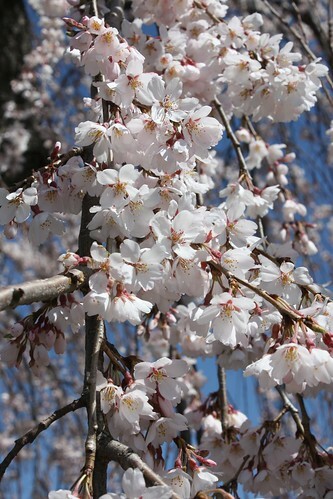 The pink trees hadn’t burst out in flower yet, but some of the white varieties had. So pretty! There was food at the Cherry Blossom Festival, but what looked good to us was horribly over priced, so we went to the Museum of the American Indian for lunch because we had heard their cafeteria was pretty good. It was. Far more interesting and tasty than what we’ve sampled at Air and Space or the Museum of American History. If you’re going to pay too much, you might as well enjoy it. We also wandered around a bit. I have to say, it’s not a great wandering museum. I think there’s a narrative to be followed and it all makes much more sense when given the time to be taken in properly. 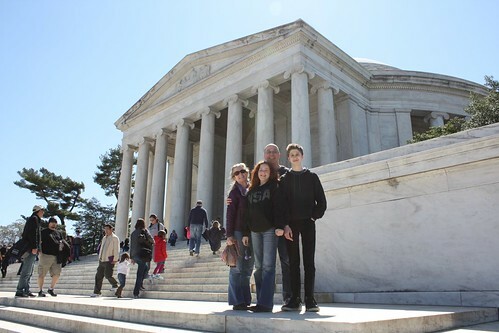 We were kinda tired from walking around the Tidal Basin though, so we’ll have to return another day for a real visit. It caught my attention that native Hawaiians were included in the mix, with an outrigger near the lobby and a photo in the cafeteria of a woman harvesting taro. We tried to find the Hawaiian parts of the native American story, but were a bit disappointed that even the Hawaiian creation myth was not included in the panoply of beginnings at the start of the tour. Oh well, I guess it’s part of America by hook and crook, not by geography like the mainland First Nations cultures. One of of other things I noticed, was Nations, a beaded flag by Jenny Ann Taylor Chapoose. It’s fantastic both in its fine detail work, and in the overall message. The juxtaposition of the comparatively few American states with the many many native tribes is both subtle and wrenching. Take the time to click the link. 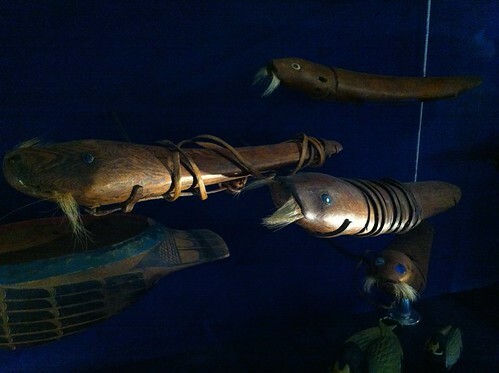 On the less serious side, the kids really enjoyed a display of animal themed artifacts, which included these net floats in the shapes of seals and walruses which I found absolutely charming. On the drive home, we stopped at the Moo Thru, an absolute must for anyone traveling on Highway 29 between DC and at least Charlottesville, if not Lynchburg. 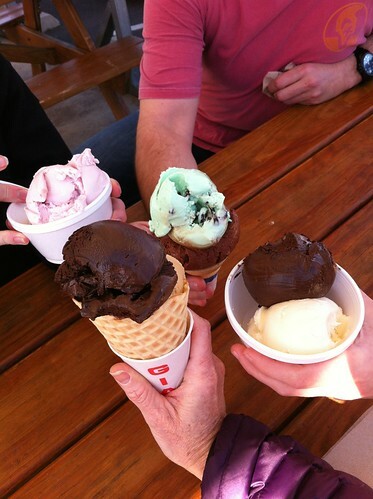 The ice cream is locally made and seriously yummy! We always see people we know there, and I’ve seen customers stop on cold November days, so you know it’s gotta be good. It was a terrific Sunday. First off, thank you to everyone who has come to visit and comment for Lynn’s Intentional Printing blog hop. It is so much fun to see all the new visits to my blog. Keep the hop rolling — there’s another week of the blog hop and then I’ll draw a random winner at the very end. In other news, I wasn’t able to attend First Friday at McGuffey last week, but I had stopped by earlier in the week to see the Art and Ecology show. Kate got lots and lots of images for her “quilt” of animals affected by marine debris. There were watercolors, acrylic and oil paintings, drawings, photos, cut paper, and mixed media. This block contains my Black Noddy and Natalya’s Northern Fur Seals! The dance group that was going to wear the plarn wings I knit was unable to, but apparently Kate’s niece had a great time with the wings and they were a big hit! 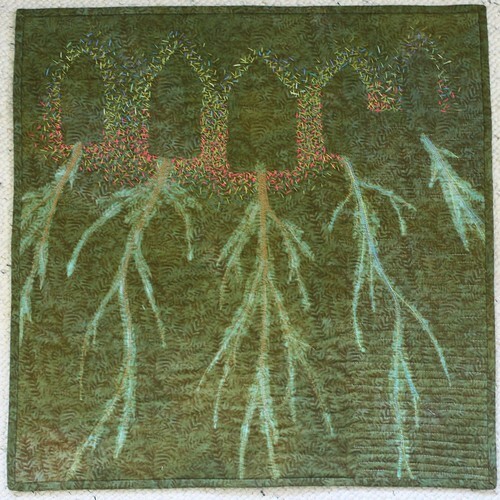 If I had a newsletter, this month’s issue would proudly announce that in addition to Zeitgeist winning best of show at Art Quilt Elements (see previous posts), I have sold several artworks recently! The first is “Staufen Vineyard,” a little landscape that I love. It reminds me of a lovely weekend with friends in a picturesque German town. We returned with my dad a few years later and had an equally lovely time. The buyer is a friend of my sister in law’s and she also has a connection to the town of Staufen. This was a Christmas present to herself. The second was a trade. After showing my work in the New Members exhibit at McGuffey Art Center here in town, one of the other artists offered a trade. We swapped one of my wall quilts for one of her wood block prints. I still need to frame hers, but I love this kind of barter! Finally, my most recent sale was to a collector who found my work via, drum roll please, Pinterest! For all the Sturm und Dramm over Pinterest, I have come to the realization that it is here to stay, that it is good organic marketing, and that I should embrace the future that is increasingly online. Speaking of the future online, I think there could be an entire separate conversation about marketing, online presence, social media, attracting collectors and enthusiasts, and keeping work fresh versus keeping work secret as a means to those ends. My experience of late is leaning towards embracing social media. I have things I’d like to show peeks of to let people who like my work know that yes, I’ve been busy, and yes, it’s more than just knitting. On the secret side, I have a piece that has been accepted into the SAQA regional show Tarnish, so I’m looking forward to unveiling that soon. I have a piece that was rejected for a book project, but will remain secret until the book is published as it still has a part in the greater event. I have another piece that I’ve been keeping secret because I’d like to enter it into Quilt National, but now an even better opportunity may have arisen, so I could be sharing that soon. There are a few other pieces in secret limbo too. And, I’ve got two secret pieces that were part of another book project, and that book is out so I can finally share — come back tomorrow for my blog post and giveaway for Lynn Krawczyk’s wonderful book, Intentional Printing! Yippee!